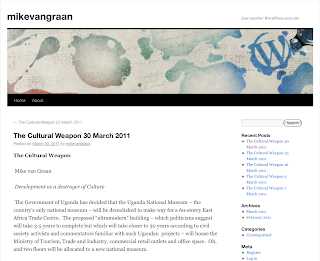 The Government of Uganda has decided that the Uganda National Museum – the country’s only national museum – will be demolished to make way for a 60-storey East Africa Trade Centre. The proposed “ultramodern” building – which politicians suggest will take 3-5 years to complete but which will take closer to 30 years according to civil society activists and commentators familiar with such Ugandan projects – will house the Ministry of Tourism, Trade and Industry, commercial retail outlets and office space. Oh, and two floors will be allocated to a new national museum. Established in 1908, the Museum is more than one-hundred years old and is thus itself a heritage site. This is a classic case of “development” versus “culture”, in much the same way as “development” has often destroyed the natural environment in the name of economic growth and social progress. For those who advocate “culture as a vector of development”, this particular case presents a major challenge, both philosophically and strategically. Increasingly, “culture as a vector of development” has come to mean the catalysing and support of the creative industries as economic drivers, as job-creation mechanisms, as generators of the financial resources that will be used to address major social and human development needs in the areas of health, education and the eradication of poverty, all important in the pursuit of the Millennium Development Goals. This is particularly relevant to Uganda whose per capita income is a mere $460 and which is ranked a lowly 143 on the Human Development Index.